Adding Value's BT Wholesale - SHINE Dinner at BBC White City event is one of six submissions for Visit London's Business Event of the Year award. Overview: The BT Wholesale SHINE recognition programme seeks to recognise employees for the great support they offer to both customers and colleagues alike, culminating in a spectacular Celebratory Awards Event so the event needed to be both ‘aspirational’ and exciting. Briefed to create a UK event for 180 guests in June 2010 that would be ‘an experience’ where guests would arrive in anticipation and leave having had an amazing evening, agency Adding Value kept the venue a secret from the delegates until arrival, which meant the excitement was palpable. London’s BBC White City and its studio three was chosen as the ideal venue. BBC White City is not only an iconic venue, steeped in TV history, but it’s a venue which highlighted the strong bond between BBC and BT. Execution: The whole theme of the event was ‘An evening with…’ and guests were treated to their own TV show experience, where they became the stars of the show. All aspects of the event from the ‘Save the date’ to the canapés were designed around the TV theme. Guests arrived with red carpet paparazzi treatment, followed by interactive tours of spaces like News and weather desks/BBC Make-up rooms, demonstrating of prosthetics and even the wardrobe room with Strictly Come Dancing costumes. The main studio space was created into a gala awards area where guests were entertained by warm-up artist Stuart Hodge (from shows Strictly and Jonathan Ross). 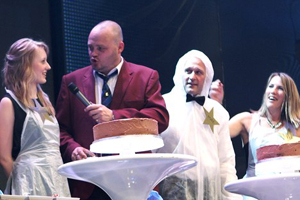 A specially created show ‘An evening with Al Murray’ was then performed with guests Sally Davis, CEO of BT Wholesale as well as celebrity stars Camilla Dalerup (Strictly) and Austin Healey. Generation Game activities were also part of the ‘TV show’ which included members of the audience getting involved. A specially designed TV themed meal was created which even included an Alan Titchmarsh Potting shed starter. The whole delegate experience was one of immersion into the TV theme and a huge success. Impact on London: This event delivered the wow-factor by using a iconic London space in a new and exciting way. It created a real impact on the target audience and their mindset was changed on London as a business destination.